Photovoltaic (PV) system performance depends on the incident solar spectrum, which fluctuates both temporally and geographically. Different solar technologies are affected in varying degree to the changes in sunlight’s spectral composition. Multi-junction devices, which are commonly used in concentrator photovoltaic systems (CPV), are influenced more profoundly by spectral changes than single-junction device technologies, such as thin-film or silicon. However, the solar industry as a whole would benefit from accurate quantification of the solar spectrum, measured in the direct normal orientation for the CPV industry and in the global horizontal or global tilted orientation for the flat-panel PV industry. 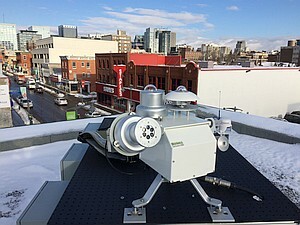 Current state-of-the-art methods for doing so involve the use of expensive, heavy, and power-hungry instruments called spectroradiometers, with a price tag approaching $100K. Our research focuses on a more cost-effective way to measure the solar spectrum by using coarse spectral sampling in conjunction with atmospheric models to reconstruct the direct or global solar spectral irradiance in the entire 280-4000 nm range. Short-term validation and calibration has been conducted at the Outdoor Test Facility at the National Renewable Energy Laboratory (NREL) in Golden, CO, USA, with subsequent testing and comparisons at the 12th World Meteorological Organization (WMO) International Pyrheliometer Comparison IPC-XII held at the World Radiation Center in Davos, Switzerland. Long-term outdoor evaluation and testing is being performed under varying temperature and sunlight conditions to determine the efficacy of this approach at the solar test facilities of both SUNLAB and Spectrafy Inc., where the commercialization of this technology is underway. diffuse horizontal irradiance (DHI): illumination scattered by the sky and other objects. The combination of DNI and DHI yields the global horizontal irradiance (GHI), for the total illumination incident on a horizontal surface. These three irradiances are measured at ground stations equipped with pyrheliometers and pyranometers, and are necessary to study the amount of solar radiation available at a location. However, measurements of each irradiance is not available in every station due to instrumentation and maintenance costs. This is especially true of DNI measurements which require a tracker to follow the sun. Consequently, most stations measure only a subset of irradiances, most typically GHI, and therefore models must be developed to provide estimates for the missing measurements. These models can also fill in missing data in incomplete data sets (e.g. instrumentation failure or during a maintenance period), or be applied to satellite data which usually outputs an estimate for GHI only. Applying these models to full data sets from different locations around the world helps to identify factors of the model that work best for different environmental conditions and notify when biases may be introduced. Presently, four models — BRL, Reindl-Helbig, DISC, DIRINT — have been applied to four locations: Al-Hanakiyah, Saudi Arabia; Boulder, USA; Ma’an, Jordan; and Ottawa, Canada. Making these three irradiances available to a wider set of locations improves the ability to assess specific new sites for the deployment of future solar power plants.